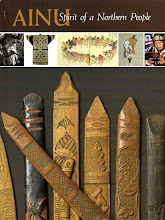 This is an immensely valuable book suited to mature readers and serious students of Ainu culture and history. 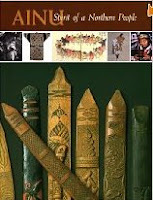 Permit me to take the easy way out and quote from the blurb on Amazon.com: "This book, which accompanied an exhibit at the Smithsonian's Arctic Studies Center, is the most in-depth treatise available on Ainu prehistory, material culture, and ethnohistory. 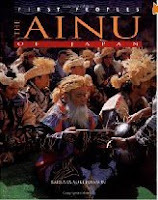 The clearly written text is divided into six parts, each dealing with an aspect of Ainu culture and each authored or coauthored by noted authorities of Ainu prehistory and culture and benefiting from contributions by Ainu scholars themselves. Included are chapters on theories regarding Ainu origins prehistory; the early scholars of Ainu culture, such as Hiram Hiller and Jenichiro Oyabe; religion and cultural practices; and material culture. Perhaps most significant is the last part of the book,which addresses Ainu social and cultural issues, maintenance of traditional cultural practices, and the future of Ainu language." If you have the time to read it, and the resources to add it to your personal library, it is a must-have book. Otherwise, find a public or school library that has it, and refer to it for the background information that will enrich your enjoyment of Ainu folklore. One of the things I struggle with when I translate an Ainu folktale, especially one targeted to young readers, is judging whether and how much to include explanatory notes. Such explanations can be woven into the text, or they can be in the form of footnotes, end notes, or appendices. Adding explanations has the potential of compromising the literary quality-- the magical flow-- of the story. But the whole point of Project U-e-peker is to make the world of Ainu culture and verbal expression accessible to the English-speaking world, and a certain amount of compromise must be accepted for the sake of accessibility. The folktales, charming enough on their own, become so much more meaningful with a little background information. A bit of preparatory reading can go a long way in helping a young person, or attending adult, to unlock their full significance. The Ainu of Japan, written for young readers by Barbara Aoki Poisson, fulfills this role perfectly. The writing is clear, accurate, engaging, comprehensive, and accompanied by illuminating photos. I recognize the value of this book all the more as I work on our most recent project, Iyomante: Meguru inochi no okurimono (see previous post), a storybook about the Ainu bear festival. 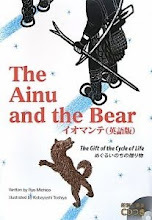 The Ainu of Japan has several subsections that will surely clarify any confusion about the significance of the bear festival to the Ainu world view and way of life. I highly recommend it. 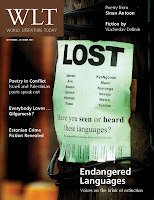 This is the second of the Ainu folk tales that were published in the September 2007 issue of World Literature Today. 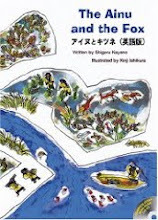 It is my abridged translation of the original Ainu yukar, and like The Fox's Song (see previous blog), we hope to get it published as a storybook for young readers of English and students of English as a second language. This tale provides an intriguing peek into the daily life of Ainu women of long ago. The accompanying illustration is the work of Stephanie Gagnepain. A woman carrying a basket was passing close by, so I called to her. But she snorted and said “Quit making such a racket, you disgusting swamp mussel!” She kicked me and my kin, and then she ground us into the mud with her foot. After that, she stomped off toward the hills. As I was crying out from the terrible pain and begging again for water, another woman with a basket was passing close by. I called out to her for help. This woman was beautiful, and she came quickly to my side. “Oh, you poor mussels. You are all dried out, and it looks like you’ve been stepped upon!” She picked us up, placed us on a big butterbur leaf, and gently put us into the clear water of the lake. When we were refreshed and had regained our strength, we studied the two women. And we learned that the first woman, the one who had treated us so cruelly, was the sister of Samayunkur. The second woman, the one who had treated us with kindness, was the sister of Okikurumi, the valiant warrior. Because the sister of Samayunkur had been cruel, I caused her millet field to wither. And because the sister of Okikurumi had been kind, I caused her millet field to prosper. The Fox's Song is my abridged translation of the original Ainu tale. We hope that some day we can get it published as a storybook for English-speaking children and students of English as a second language. It is special among the folktales transcribed by Chiri Yukie (see previous blog), in that it has plenty of humor. As to be expected, however, it is a tale with a moral. 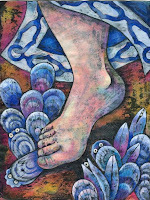 The fifteen illustrations were done by Sarah Davidson, but only the one posted here was included in the version published by World Literature Today. One day I went to the seashore to search for something to feed my family. I slipped between the rocks and slid between the driftwood, until I saw a whale washed up on the beach up ahead. Humans were hopping around with glee. Some of them were cutting the meat into pieces to carry home. Some were chanting prayers to thank the whale spirit. I became very excited. “Hooray, hooray! I have to figure out how I can have some of that whale meat,” I thought. I slipped between the rocks and slid between the driftwood until I was very close. So once again, I slipped between the rocks and slid between the driftwood. Up ahead I saw a boat. In the boat were two humans who seemed to be arguing. “Now that’s interesting,” I said to myself. “Let me find out what they’re so angry about.” I slipped between the rocks and slid between the driftwood until I was very close. So once again, I slipped between the rocks and slid between the driftwood. I came to a river and followed it upstream. Up ahead I could see two women standing in the shallows, weeping. “I wonder why they are so sad,” I said to myself. “I think I’ll get up close and find out.” I slipped between the rocks and slid between the driftwood until I was very close. So once again, I slipped between the rocks and slid between the driftwood, following the river upstream towards my home. Up ahead I saw that my house was on fire. The smoke was rising high up towards the sky. I screamed to raise the alarm. Then someone came rushing towards me and I saw that it was my wife. She was in a panic. “What is it? What’s wrong?” she asked. I looked at our house and started to explain. "The Ainu are a people indigenous to the island of Hokkaido, Japan, though they were once spread across northern Japan, the Kurile Islands and Sakhalin. The spoken language, at least as a means of daily communication, was said to have died out by the latter half of the 20th century, to be remembered by only a handful of very elderly Ainu. But increasing worldwide attention to the rights and dignity of indigenous peoples has recently resulted in renewed and better-funded efforts to revitalize Ainu language and culture. The Ainu language does not have a writing system, but its oral tradition is rich and varied. The two Ainu tales included here were first transcribed from the oral tradition by Chiri Yukie (1903-22), a linguistically gifted Ainu girl who was born and raised in a time when the Ainu were scorned as an inferior people by mainstream Japanese society and authorities. But a timely encounter with the Japanese linguist Kindaichi Kyousuke (1882-1971) transformed Yukie into a forerunner of a movement to reclaim Ainu ethnic pride. And when she died of heart failure at the tender age of nineteen, she left behind an anthology of fourteen animal yukar (chanted epic tales) published posthumously as the “Ainu Shin’youshuu” (Collected tales of the Ainu gods). “The Fox’s Song” is a retelling of the Ainu tale “Towa towa to: A Song Sung by the Fox,” and “The Swamp Mussel God’s Song” is a retelling of “Tonupeka ranran: A Song Sung by the Swamp Mussel God.” The preface she wrote for the anthology is quoted in part below. These words moved the hearts of many who read them, both Japanese and Ainu, and they continue to speak to readers of all nations and languages today. Long ago, this vast land of Hokkaido was the free home of our ancestors... But that peaceful sanctuary is now a thing of the past... Before we realized it was happening, Nature... had become faded, and the people, who had once lived so joyfully in the meadows and the mountains, are nowhere to be found. The few of our people who remain are helpless to do anything but watch in astonishment as the world continues to push ahead. Even worse, our eyes have lost the sparkle of the once beautiful spirit our people had in ancient times, when every aspect of our lives was imbued with religious perception. How shameful we appear--filled with unease and discontent, our sense of direction dulled, dependent on the pity of strangers. We are a perishing people--that is what they call us now. What a sorrowful name we have to bear! But... what of the many words and well-used phrases our beloved ancestors used daily to relay their thoughts to one another, the many beautiful expressions they passed from generation to generation--are they doomed to disappear along with our dying people? That would be too tragic to bear! Having been born an Ainu, and raised hearing and speaking the Ainu tongue, I have set down in my awkward hand, a few short tales from among the great many with which our ancestors entertained themselves when they gathered on rainy or snowy nights, or any time they could find a spare minute. If the many people who know of us could read this collection, it would bring me, along with my ancestors, boundless delight and supreme joy." In the spring of 2005, our application for a grant was accepted by the Ainu Foundation, making it possible for us to publish our English translation of Ainu to Kitsune. The original tale had been handed down in oral form among the Ainu from generation to generation, finally to be transcribed and translated into Japanese by the Ainu activist Kayano Shigeru (1926-2006). Some time later, at his publisher's request, Kayano rewrote it as a children's story. It was then combined with Ishikura Kinji's marvelous illustrations and published in 2001 by Komine Shoten as a delightful storybook. We had been given the honor of translating this book into English. The translation was published in 2006 by RIC Publications under the title The Ainu and the Fox. In brief, it is the story of a fox who makes a charanke (passionate appeal) to the Ainu community, claiming that the humans are taking more than their fair share of nature's bounty, even refusing to share with the animals as the gods had intended. Kayano, who had been seriously ill for some years, lived just long enough to meet with us and representatives of the press at his home in Nibutani where, to his great satisfaction, we presented him with a copy hot off the press. (See photo in previous blog post.) The entire first printing of the book was distributed all over Japan and even across the sea, to school libraries and institutions known to have an interest in indigenous peoples. Several years ago, I was invited to write about the "birth" of Project U-e-peker for ikjeld.com, a website for Japan-based news. I've pasted the bulk of the essay below. You can find the original article at http://www.ikjeld.com/japannews/00000457.php. "Project U-e-peker came into being on February 9, 1999, when three people of different nationalities and professions gathered at my home in Sapporo to discuss what we could do to make Ainu folk tales more readily available in English-- particularly in the light of the potential resources of the recently established Foundation for Research and Promotion of Ainu Culture (hereafter: Ainu Foundation). Our team rep, Hakodate-based Peter Howlett, had been using his own translations of Ainu folk tales in his ESL (English as a second language) syllabus for years, developing teaching materials that included notes in various languages (primarily Japanese, Korean, and Russian) so that they could be used beyond the context of Japan's ESL classroom, as part of a vision to create "classrooms without borders." Noriyoshi Owaki, retired English teacher, former president of the Minority Group Conference, and secretary general of the National Network in Support of the Ainu Communal Property Case, approached our project from the perspective of preserving Ainu dignity and ethnic rights. As a professional translator, my own approach to the project was a deep interest in the oral literature of an overlooked and under-appreciated culture. Like Peter, I had lived all my life in Japan, most of it in Hokkaido, in close proximity to the few remaining Ainu hamlets. Our physical appearance and nationalities had forced us to be categorized as outside the mainstream in the land we have called "home" for over fifty years, and maybe this is one reason why we were drawn so by the plight of the Ainu. With each subsequent meeting, the membership of Project U-e-peker grew, encompassing more nationalities, professions, and perspectives along the way. 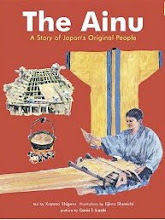 Our first breakthrough came when Peter's translation of Ainu Nenoan Ainu was published by Tuttle Publishing as The Ainu: A Story of Japan's Original People (2004). Originally written by the Ainu activist Kayano Shigeru (1926-2006), it is a meticulously illustrated description of the traditional Ainu lifestyle and values in which he had been raised. In 2005, the Ainu Foundation accepted our application for a publishing grant, and my translation of Ainu to Kitsune, Kayano's rendition of a traditional Ainu folk tale, was published by R.I.C. Publications as The Ainu and the Fox (2006). We hope to eventually publish our English renditions of the tales in Chiri Yukie's (1903-1922) famous yukar anthology, titled Ainu Shinyoushuu (Collected tales of the Ainu gods). In 2006, shortly after the publication of The Ainu and the Fox, we established a Project U-e-peker website to inform the public of what we hope to accomplish and why. We are spread over several nations and continents, but our common desire is to have a part in drawing the world's attention to the literary charm and social/ecological wisdom contained in the Ainu oral tradition, before it is snuffed out in the general apathy which faces it in Japan." With the expansion of the Japanese state into Ainu lands, the Ainu people were displaced, their rights ignored, their language, culture, and dignity diminished in the forcible attempt to assimilate them into mainstream Japanese society. It is a tragic history shared by many native peoples throughout the colonized world. Japanese schools offer little or no education in the history and culture of the Ainu people. They are virtually ignored in the officially sanctioned curriculum. As ESL (English as a second language) teachers and translators, we felt that we were in a position to do something about this negligence. Ainu culture and values have been preserved in a rich oral tradition. This includes Yukar (epics), Upaskuma (local history stories), and U-e-peker (folktales told in conversational style). Our goals are (1) to translate Ainu folktales into English and (2) to introduce these translations to the English speaking world and into the ESL syllabus of schools in Japan and its neighboring countries. By doing this, we hope to stimulate interest in Ainu culture, not only abroad, but also among Japanese school children now occupying the land once known in the Ainu language as Ainu Mosir (the land where humans live). In future blogs I plan to explain what the team has already accomplished toward those goals, and what new challenges lie ahead of us.